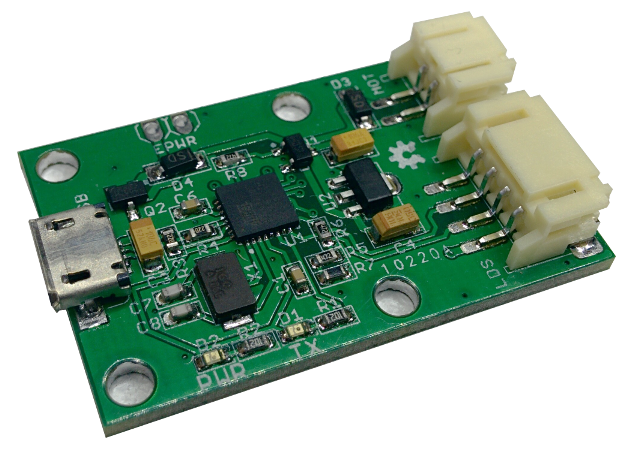 The USB2LDS is a board that makes it easy to use a Neato LDS (the LIDAR from the Neato XV-11, XV-25, etc… vacuum-cleaner robots) with a PC. It plugs into the PC through a USB Micro cable and has ports for the LDS and its motor. IMPORTANT NOTE: this device is different from the one made by Robotis Inc, and while it serves a similar purpose, it does not work with the same sensors. My version pre-dates the one from Robotis by 3-4 years and only works with the old sensors salvaged from Neato Robotics robots. If you want a device that works with the 360 Laser Distance Sensor LDS-01, then get the Robotis USB2LDS. Powered from USB, and it powers both the sensor part and the motor. Plug the two connectors of the Neato LDS Lidar on one end, a USB cable on the other. Connect the cable to your computer, and if needed, install the INF Driver (for Windows). Open the serial port that has been created with a baudrate of 115200. The motor will start turning and data flowing. It is however NOT human readable, you need a library to decode it and use it. Right now, I only assemble boards on demand, so drop me an email at contact@xevelabs.com. Price is 30 USD / 30 EUR. Shipping is 5 EUR for France, 10 EUR for Europe and 15 USD for the rest of the world. Nicolas Saugnier (Xevel) - everything so far. Dean Camera for making the greatest USB library for AVR, LUFA. Weston T. Schmidt for making the cross-platform app DFU-Programmer!